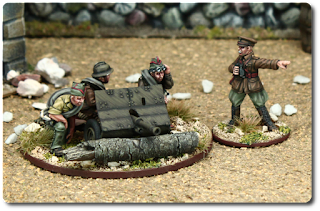 At CRISIS in Antwerp I, of course, couldn't withstand the temptation to get my grubby fingers on the new Volksgrenadier sets by Empress Miniatures. They're sculpted by Mr. Paul Hicks again and suffice to say they're lovely. 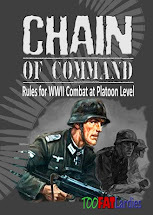 Also I haven't done another WW2 painting guide for quite a while, so I thought this might be the chance to cover yet another infamous German camouflage pattern. The "Sumpftarnmuster" or swamp/ marsh pattern camouflage scheme was introduced in 1943. It was a variation of the older and more well known "Splittertarnmuster". It came in two main types namely the M1943 pattern with hard edged spots of red-brown and green, as well as the M1944 pattern blurred edge version. After the war it was used by the Federal German Bundesgrenzschutz, in short BGS, from 1952 till the late 80's. It was exported to several countries abroad and for example some Libyan units wore it as late as 2007. To round out my little Republican force I felt I'd need at least another squad of International Brigades before going back to paint some more Nationalists. While lecturing about the lack of need for dedicated Anti-Tank support weapons in Bolt Action in my last post, I still liked this little cutie too much not to paint it up. The Bofors 37mm gun was used in small numbers by the Republicans during the Spanish Civil War. Its performance was roughly comparable of that of the contemporary German 3.7cm PaK 36 as used by the Nationalists.